Likely to sell out! 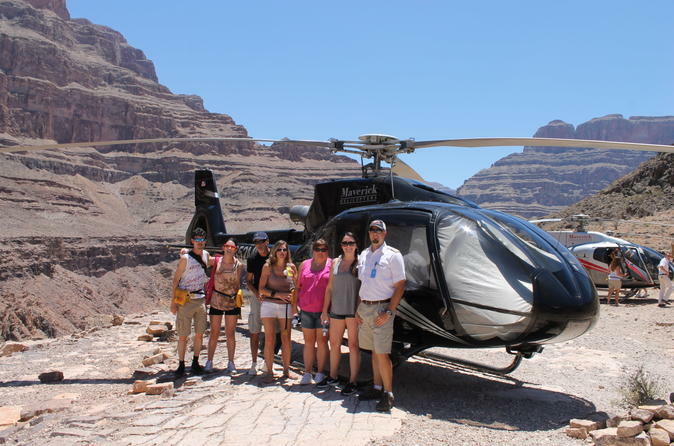 The Grand Canyon Helicopter Tour regularly sells out weeks in advance. Book ahead of time to avoid disappointment. After pickup from your Las Vegas hotel by luxury van at your selected time, you'll be taken on a short ride to the Henderson Executive Airport, where you'll board a state-of-the-art helicopter for an exciting 40-minute flight to the Grand Canyon. Settle into your comfortable leather seat and enjoy a smooth, air-conditioned flight over Lake Mead and Hoover Dam, both spectacular sights from the air. Large windows offer great views for all passengers, and you'll be provided headphones so you can learn about the sights you see through recorded commentary. When you reach the Grand Canyon West Rim, descend 3,500 feet (1,066 meters) below the canyon rim -- deeper than any other Grand Canyon helicopter tour! Land on a private bluff overlooking the Colorado River, where you'll toast to this unforgettable experience with a glass of Champagne. Enjoy light snacks including vegetables, fruit, crackers and cheese under the shade of an authentic Native American Ramada shelter, and fill your camera with incredible photos of the steep canyon walls from this amazing vantage point. Your pilot will be happy to answer any questions you have about the canyon or your helicopter flight. Hop back on the helicopter for your return flight to Vegas, this time flying low over Black Canyon and Fortification Hill, an extinct volcano. When you land, your driver will be waiting to whisk you back to your hotel. There is a maximum capacity of seven people per helicopter, plus your pilot. Per FAA regulations, all passengers 18 years and older will be required to show photo ID such as a driver's license or passport at the time of check-in. Special Offer - Book and save 22% compared to the local supplier's prices! - Book Now!